Sunday was Blake's very first trip to the cinema (Covent Garden Odeon) to watch a feature length film and that film was the Smurf's 2! (He's only ever been to a cinema before to watch short cartoons and clips) He loves the first smurf film and watches the original cartoons and already has a couple of 80's smurfs to play with. 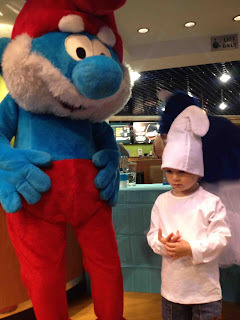 We were there to celebrate the launch of Jakks Pacific's new Smurf Toy collection which is awesome! The mushroom playhouses are amazing and a great "take along" size. 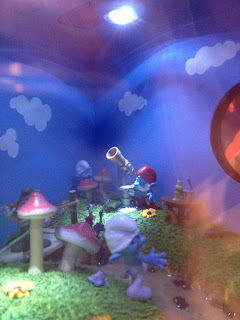 We also loved the grab 'em figure packs - perfect little poseable smurfs! 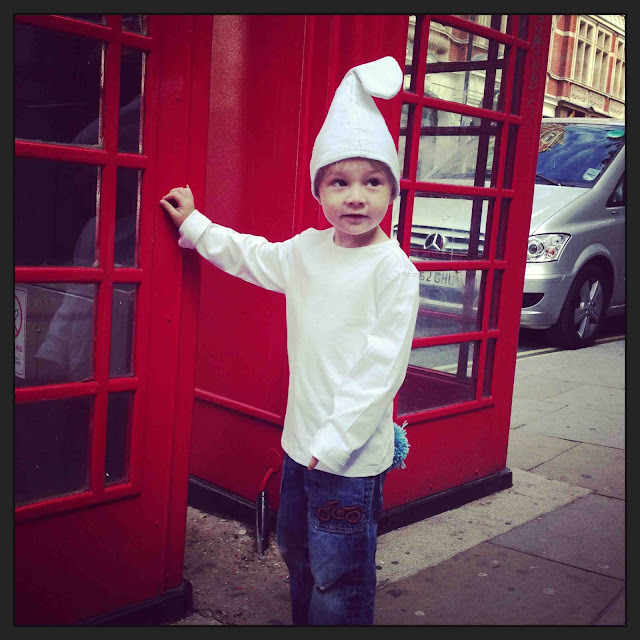 Blake has already requested the Papa Smurf Mushroom house for Christmas! The film was great fun and I was very impressed with how well Blake did, I have to say I was a little unsure of how he would do as at home, he doesn't really sit through a full film. To get in the spirit of things, Blake dressed as a Smurf wearing a white tee, blue jeans, a Smurf hat and a home-made pom pom tail! 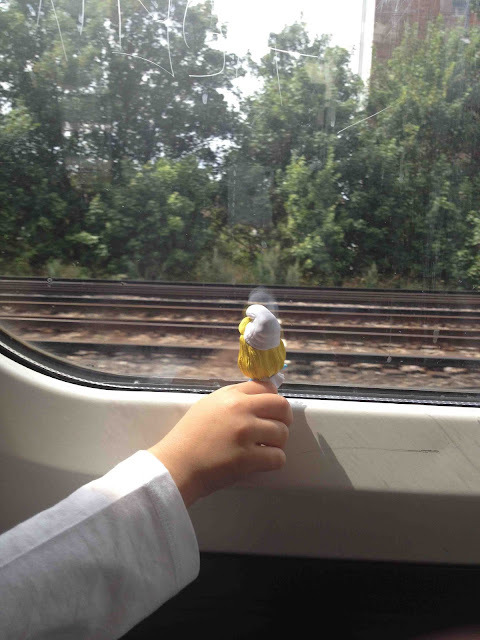 He looked very cute but wasn't up for having his face painted blue! I had on my navy blue dress with rabbits all over it and a white cardi as my very subtle nod to the blue and white theme and nature loving Smurfs! We had great smurfy entertainers and lots of games and activities for the children after the film. 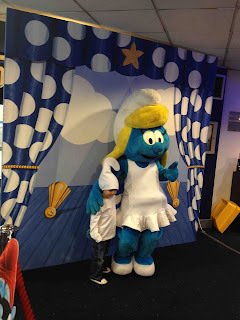 Blake loves meeting Smurfette and Papa Smurf - and there was a really fun peep hole into a smurf village! Blake received a goody bag with a Smurfette in it - I was expecting a little disappointment from him for having "the girl one" but he's actually chuffed to bits! And so is his little sister, Meg! Jakks launches Smurf-tastic Toy range for 2013! Hitting stores around the release date of hotly anticipated movie sequel, Smurfs 2, on 31st July this year, Jakks is bringing the magic of Smurfs onto toy shelves nationwide to delight fans young and old! The lovable blue characters make a welcome return to cinemas nationwide through Sony Pictures Animation this summer, with the Smurf Village-dwelling heroes once again pitted against the evil machinations of wizard Gargamel. 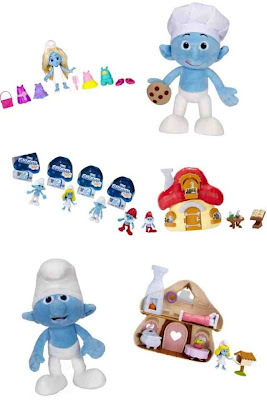 Introducing some weird and wonderful new Smurf faces alongside much loved Papa Smurf, Smurfette, Clumsy and more, fans can now collect sets of figures seen in the movie and re-create classic scenes using new Jakks’ play-sets and accessory packs. Featuring highly detailed articulated 2.75” figures plus individual accessories, the new collectable Grab ‘Em Single Packs include some of the Top 10 Characters from the animated movie including Grouchy, Clumsy, Papa Smurf and the two new Naughties: Vexy and Hackus. Home Sweet Home to the adorable Smurfette or Papa Smurf, open the door to one of two Mushroom House Play Sets each with distinctive red or pink roof and matching window decoration. Both sets come packed with themed role play accessories including individual Smurf character figure. Measuring 3 apples high, Smurfette has been transformed into a 7.5” Fashion Doll complete with fabulous mix and match outfits to brighten any blue day! Simply snap on one of herSmurfy dress combinations, add a stylish accessory, pop on shoes and Smurfette is ready for anything! With flowing stylable hair and a unique Smurf Berry scent, this glamorous jet set Smurf has everything she needs to help her stay up to date with the latest Smurf trends! 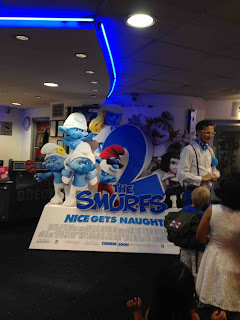 In this sequel to the hybrid live action/animated family blockbuster comedy The Smurfs, the evil wizard Gargamelcreates a couple of mischievous Smurf-like creatures called the Naughties that he hopes will let him harness the all-powerful, magical Smurf-essence. 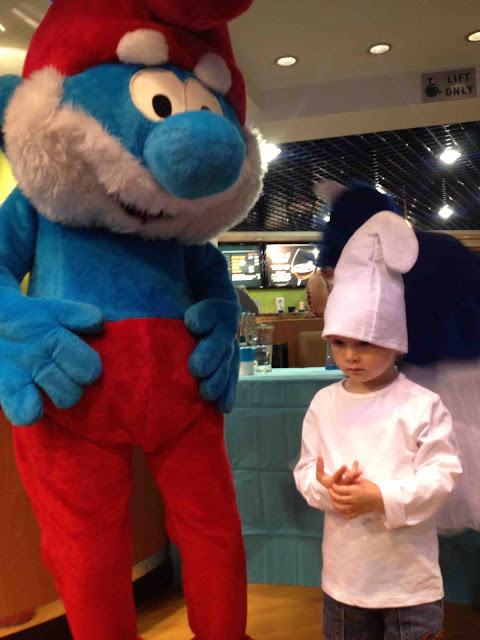 But when he discovers that only a real Smurf can give him what he wants — and only a secret spell that Smurfette knows can turn the Naughties into real Smurfs — Gargamel kidnaps Smurfette and brings her to Paris, where he has been winning the adoration of millions as the world’s greatest sorcerer. It's up to Papa, Clumsy, Grouchy, and Vanity to return to our world, reunite with their human friends Patrick and Grace Winslow, and rescue her! Will Smurfette, who has always felt different from the other Smurfs, find a new connection with the Naughties Vexy andHackus – or will the Smurfs convince her that their love for her is True Blue?